Anyone who reads my posts knows how I feel about Stitch Fix, spoiler alert, love it, here’s a link to one of my Stitch Fix Reviews if you want to know how much June Stitch Fix Review But when I talk about Stitch Fix, I notice a lot of confusion with Thred Up, the fashion resale website which I also use. Here is a review of my Thred Up experiences. 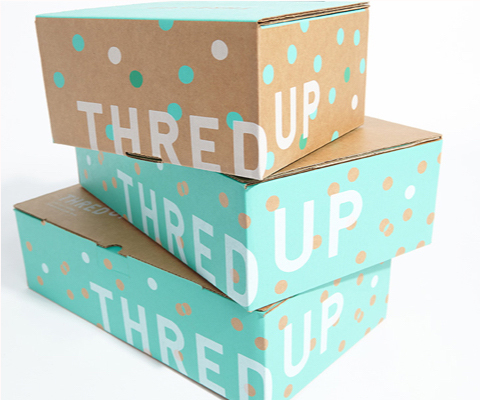 People are always confusing Stitch Fix and Thred Up, I think it’s because they both deal with clothes, have amazing branding and use a kicky greenish color in their logos. But the two companies could not be more different. Stitch Fix is a wardrobe service which sends you new clothes every month to try on and possibly purchase. Conversely, you send gently used clothing to Thred Up, in return they either give you money or credit which you can use to purchase other used clothing on their site. I have used Thred Up several times now, and I feel I have enough experience to give an honest review. 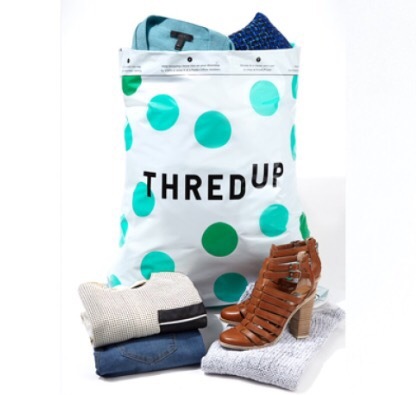 The first time I used Thred Up, I was on a full Kondo inspired purge of my closet and had just heard of the service so I gave it a try. If you are not familiar with Thred Up, this is how it works. You request a clean out bag on their site and in about a week you receive this adorable polka-dot bag in the mail. You then proceed to fill up this mammoth bag with gently used, name brand clothing and mail it back to the company. The bags will fit A LOT of clothes, a warning, your postman/woman may not love this, it can get really heavy. You might consider taking it directly to the post office, because if you work in an office like me, and leave it with the other mail, the brightly colored bag is not exactly discreet. Once Thred Up receives the bag, they process it and send you an email outlining what they accepted and the assigned sales prices. They may pay you upfront for some items and take others as consignment sales. You will immediately have credit in your account for the upfront items, or you can request PayPal credit or a prepaid Visa card. With consignment sales, you can monitor items and either adjust prices or reclaim an item during the 84 day consignment period. If you reclaim an unsold item within 14 days of the end of the consignment period, you pay the shipping costs, if you don’t, Thred Up owns it. How my Thred Up Bags fared. In November of 2016 I sent in a bag stuffed to the gills. I remember it took a really long time for them to process it, but when they did, I received $73.45 upfront and I was thrilled. After paying the $6.99 shipping fee, I had $66.46 to play with. I used that credit, plus a 20% coupon code, to score a Tomas Maier (former head of Bottega Veneta) red leather handbag that retailed for $850.00. It was a great trade and I was very happy with my experience. That bag is still in my handbag rotation. My second bag was in January 2017. Again, I packed up a big green and white bag with some of my best used stuff and sent it on its way. This time the processing was much quicker, but the upfront payout was only $36.80. Some of the items went to consignment with potential sales of $58.64. By the end of the consignment period all but two items had sold, so I ended up with $91.09 in total sales. After paying the shipping fee, which had increased to $9.99 by then, because giant bag, I netted $81.10. Not too bad, I was really getting the hang of this Thred Up thing. The third time I used Thred Up was in February of 2018. Having had two great experiences I gleefully filled up another bag and sent it in, I was after all, a Thred Up pro at this point. The processing was lighting fast this time, however, I was shocked when the upfront payout was only $14.50. Not to fear I still had a potential $51.33 in consignment. Everything was going to be fine. Not so fast there cowgirl. This time I was not so lucky. Despite adjusting my consignment prices down several times, I only received $23.03. My total on that bag was a disappointing $37.53. Determined to rebound, I put together a more curated bag which I sent in May 2018. Following the guidelines of what they were looking for, I was sure this bag would do well. Cue the sad trombone music. On my last bag I got zero dollars upfront and potential consignment sales of $27.40. So far one item has sold and my portion of that sale is $4.68. Super disappointing. It is entirely possible the items I sent were neither the brands or quality they are looking for, but I doubt it. I was pretty careful not to send dated or excessively used items. In fact, some of the items they rejected were new, brand name items, with the tags still attached. So I am not really sure where it all went wrong. Bottom line, I will probably not be using Thred Up again. Since I strongly believe in the concept of fashion resale, I would not go so far as to discourage others from trying this service. However, I think in the future I will take my items to thrift shops run by local charities and try to keep the money in my community. Have any Thred Up experiences to share? I would love to hear other people’s stories.